Ingredients: Grain Products (millet), Sunflower, Calcium Carbonate, Vitamin A Supplement, Vitamin D3 Supplement. 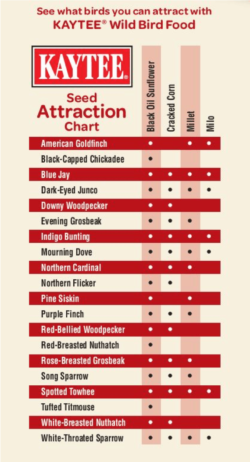 The best single grain for attracting the widest variety of wild birds. Ingredients: Oil Sunflower, Cracked Corn, Millet, Peanuts, Striped Sunflower, Artificial Cherry Flavor. specially formulated to attract more colorful songbirds year-round. Ingredients: Sunflower, Cracked Corn, Milo, Millet, Wheat, Peanuts, Calcium Carbonate, Safflower, Artificial Cherry Flavor. Specially is formulated by birding enthusiasts to attract more birds to your backyard and increase nutritional value. · 1866-1897 – Nicholas Knauf starts his own grain and feed business in Sheboygan, Wisconsin. Knauf opens a branch elevator in Brillion and sends 500 railroad carloads of wheat per year to the then thriving flour mill town of Milwaukee. Nicholas Knauf builds a grain elevator in Chilton, Wisconsin, which becomes his corporate headquarters. William N. Knauf (the 19-year-old son of Nicholas), Frank Tesch, and Milton Jones form a partnership. Under the subsequent ownership of Knauf & Tesch (K&T), the business supplies area farmers with clean, reliable seeds. They purchase the grain elevators from Nicholas Knauf in 1897. Knauf and Tesch become a Wisconsin-based corporation. · 1920s – Knauf and Tesch make the move to become a national distributor of dried peas for pigeon feed, soon producing bird and small animal foods. · 1940s – These pioneering years for wild bird mixes actually create the wild bird food category. In 1945, William Engler, Sr. joins the company. Tesch handles the dairy food portion of the business, while Engler manages the wild bird, pet bird, and small animal products. · 1950s – Capital Airlines, which carries a parakeet as a mascot on every flight, selects Kaytee Parakeet Mixture exclusively to keep their parakeets healthy and happy. This is the beginning of innovative and creative Kaytee advertising and marketing. · 1960s – In 1964, William Engler, Sr. buys out Knauf and Tesch and makes the decision to leave the dairy and hog business to concentrate on bird and small animal foods. This visionary leader recognizes the growth potential of products that meet the needs of the ever-growing bird feeding hobby and companion pet market. · 1970s – Formal company name changes to KAYTEE PRODUCTS, INCORPORATED. Manufacturing facilities expand as new bins, warehouse space, and manufacturing plants are needed to meet growing customer needs. · 1980s – In 1984, ownership transfers to fourth generation family, the great-grandchildren of Nicholas Knauf: Bill Engler Jr., Michael Engler, and Virginia Engler-Gilmore. Kaytee grows tremendously as facilities expand, a national sales force is established, computer systems are installed, and the employee base expands. · Early 1990s – Kaytee responds to the needs of customers by acquiring facilities strategically located across the country. This national manufacturing and servicing capability allows for the freshest quality products delivered quickly and efficiently to every Kaytee customer. Kaytee enters international markets including Canada, Japan, the United Kingdom, Singapore, and many other countries. · 1997 – In December, Kaytee is sold to Central Garden & Pet, a publicly traded manufacturing and distribution company in Lafayette, California. Kaytee’s new affiliation with other brand leaders and the only national direct store distribution company in the pet industry strengthens relationships, attracts new customers, and supports continued business growth. · Early 2000s – State-of-the-art barrier packaging, functional package design and structure, and investment in improved manufacturing processes add quality and value to the entire range of Kaytee Products. · 2005 – Central Garden and Pet acquires Pets International, Ltd., manufacturer of Super Pet brand of cages and accessories for small animals and pet birds. · 2006 – Kaytee and Pets International join forces with headquarters located in Chilton, Wisconsin. The Central Avian & Small Animal SBU (Small Business Unit) is formed and continues to energize the small animal and bird categories with this outstanding relationship. · 2013 – Pets International embarks on the rebranding of its Super Pet® products to Kaytee brand. · Today – At Kaytee, we believe in the incredible life connection between people and their pets. We are dedicated to providing the highest quality foods, habitats and accessories as your pet’s health, security and comfort is our top priority. Whether feathered or furry, we are passionate in creating a total solution of products that you can trust because at Kaytee no pet is too small to love Kaytee continues its tradition of scientifically-formulated products and unparalleled service, a tradition firmly rooted in the past with a vision toward the future.